I am one of the Directors of MKB Law, with specific responsibility for overseeing the Family and Matrimonial department. Having graduated in Law from Queen’s University in June 1985, I have been practicing exclusively in the area of Family Law for over 20 years in Belfast. At MKB Law my case load covers a broad spectrum, from divorce settlements to Children Order Proceedings both private and public. I am passionate about the well-being of children, and assist my clients with cases relating to child contact, child residence and Special Educational Needs. 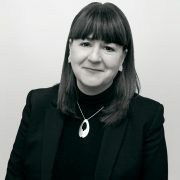 I am one of a small number of Solicitors representing children on behalf of the Northern Ireland Guardian Ad Litem Agency, and am a member of the Management Committee of the Childrens Law Centre in Belfast. In matters of matrimony, my clients interests are of paramount importance to me. I ensure that all clients are made aware of their options when going through a divorce, and I strive to offer my full support throughout this difficult process. I am a qualified advanced Solicitor Advocate which allows me to represent clients in all Courts, and am also a member of the Collaborative Divorce Lawyer Panel. I have also trained as a Mediator with the Institute of Professional Legal Studies. In my spare time I enjoy listening to music (especially Bruce Springsteen), and reading cookery books – one day I hope to actually be able to implement the dishes!